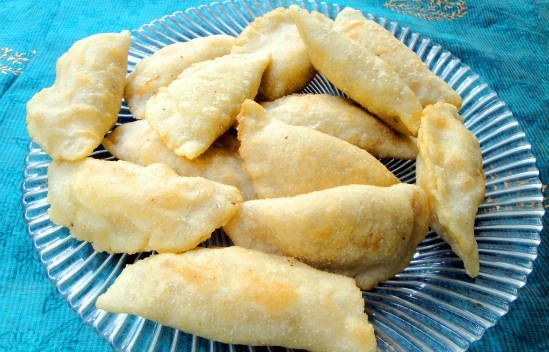 A popular Diwali sweet/dessert, Karanji is made with maida with a sweet filling inside and deep fried until golden brown. 1. Combine the maida, ghee and salt in a large bowl. 2. Add enough milk and mix well to a thick dough. 4. Dry roast the coconut and remove. 5. Heat little ghee in a pan. 6. Fry the maida and poppy seeds for a minute. 7. Remove and mix all the filling ingredients. 8. Grind them together and keep aside. 9. Make small balls of the dough. 10. Roll them into small puris. 11. Place some of the filling inside and fold to form a half-moon shape. 12. Using some water or milk, seal the edges. 13. Heat oil in a deep frying pan over medium flame. 14. Fry the prepared karanjis until light golden brown. 16. Store in an airtight container. Feel free to comment or share your thoughts on this Karanji Recipe from Awesome Cuisine.